Fool me once, TWD, shame on you; fool me after nine seasons and I guess I’m just an idiot. For a second there, I thought maybe we had Alpha all wrong. Perhaps her magical ability to exfoliate her skin and power wash her rotten teeth — along with her lovely new sundress and scalp-wig — changed her whole perspective. After all, Alpha let her daw-dah live, then not only captured Daryl’s search party alive, but also freed them without so much as a scratch. She even gave their weapons back and kindly pointed them to the way home. But Alpha proves she’s even more deranged and dangerous than anyone thought. The result is one of the show’s most memorably shocking scenes ever and the best episode in a long time. It’s not like there weren’t plenty of clues along the way that something wicked was this way coming. The story of Miles and Hilde sets the tone: a young couple in love who found shelter at Hilltop, washed up real nice, and hoped to start a business selling trinkets carved with the letter “H.” Maybe that symbolizes “Hilltop” or “home”; better yet, like the Faire itself, maybe it represents “hope.” But this fairy tale story was doomed from the start, because let’s face it — fairy tales don’t end happily anymore. Need proof? We cut to Hilde’s lifeless body on the ground, the sound of knives sharpening, and a familiar tune as Alpha begins to carefully remove her hair. A rather ominous sign: nearby in the dirt lies a bloody “H” necklace. The Faire finally kicks off with, of course, a Zeke speech. He hits the right notes — giving props to Rick, Carl, and Jesus before declaring, “The crossing over the river may be gone, but we built a bridge nonetheless.” Preach, King! Jerry wanted to call this thing the First Annual Intercommunity Reunification (a.k.a. FAIR; good one, Jerry!) but Zeke opted for the rather yawn-inducing Fair of New Beginning. Off fly some doves or pigeons or some such white, peace-symbolizing birds, and then it’s off on an emotional roller coaster of reunions and said new beginnings. 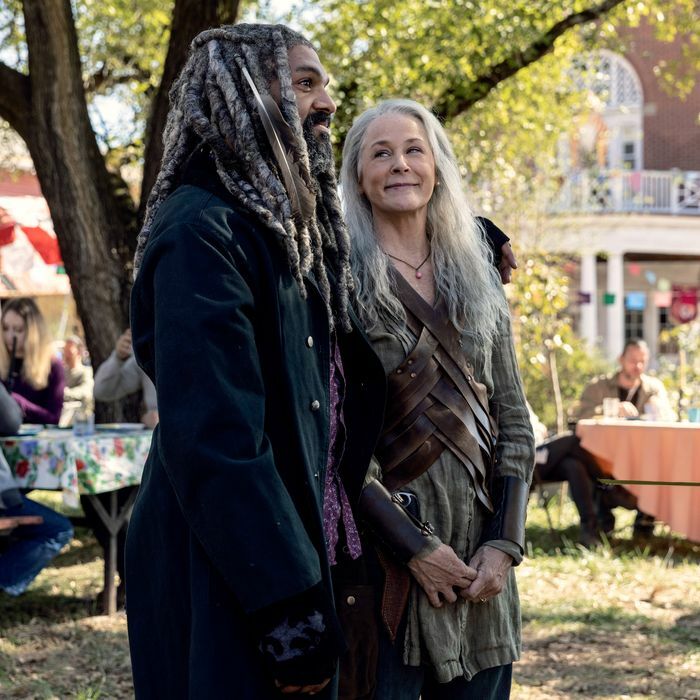 I was more choked up watching Carol reunite with Daryl than with Henry; if you weren’t teary already, enter Judith, who hasn’t seen Carol or Zeke in years but says she’s been drawing pictures of them all this time. That kid will melt your heart and stab a zombie in the face — without a doubt the greatest Grimes of all time. The next order of business is Michonne calling a meeting of the leaders to deal with Lydia’s return. The old “remember when you were the outsider” argument works on Tara, and soon they all agree to defend Lydia and each other with a “mutual protection pact.” (Note that the rep from Oceanside doesn’t look familiar because it’s Rachel, the smartass, loogie-spitting, bird-flipping little girl who’s now all growns up.) Meanwhile, Henry gives Lydia a tour of the Faire: Sid and Enid work the “CPR Lessons” booth, which is not a popular attraction; Earl shows off his blacksmith-y wares and his old lady Tammy Rose flaunts their Skinjob baby; Judith sends Eugene into the dunk tank to much applause; and Alden and Luke argue over mid-tempo ballads while Enid drops the “b” word. Again, there’s no way this picturesque scene doesn’t end in horror. It’s obvious to everyone that the Whisperers are a serious threat, so they assemble a formidable hit squad — Daryl, Carol, Michonne, Yumiko — to go defend Hilltop. What they don’t realize is that the Faire has been infiltrated by Alpha, who deserves multiple apocalyptic Oscars for wardrobe, makeup, original script (clever Michonne name-drop and talk of “sweater weather”), and her ability to erase any hint of her Southern drawl. Zeke delivers the most ironic line of the night as he talks to “Debbie from Alexandria,” who’s apparently the winner of Extreme Makeover: Whisperer Edition: “I think we clean up pretty well if I do say so myself,” he says. If you only knew, King. If you only knew. Alpha flexes hard by leading Daryl to a herd larger than any he’s seen before. That’s the Whisperer army, and if it’s steered toward the communities, they’re in big trouble. Alpha seems to offer a strange truce — they can keep Lydia and no more blood will be shed as long as Daryl’s people stay out of her land. She’s marked the borders; Daryl will see them when he meets up with his friends, who are safe. Peace can’t come this easily, right? Lest we think Alpha really is a changed woman, we see her preferred method of stress relief — not dirt yoga or out-of-her-mindfulness, but stabbing a Whisperer in the head for no particular reason. Alpha sets up a literal jaw-dropper. Daryl’s hit squad finds Sid in bad shape as he points to ten posts topped with heads — the border marker that Alpha had noted. As Sid later reveals in his tribute to the fallen, the Whisperers somehow (impossibly, I’d say) captured his group who fought back valiantly but were no match for Alpha’s butchers. The identity reveal of each chattering zombified head is excruciating. First there’s the Cowboy and his Highwayman pal, who’ll never get to see that movie, along with Lumberjack and Frankie, Negan’s redheaded Saviorbabe. Perhaps if Tammy Rose was a little more low-key about the Whisperbaby she stole, her head wouldn’t have ended up on a pike. Poor nerdy Addie deserved better, but at least they left her glasses on; snot-nosed bully and noted ne’er-do-well Rodney, however, got what he deserved. Let’s be honest — I can live without that bunch. Things get worse as we cut from the Faire to the crime scene. Alden struggles through “The Way You Do The Things You Do” and looks around for his girlfriend — Enid, dead! Gabe asks Eugene about someone, perhaps the woman from Hilltop he’d recently complemented as a worthy leader — Tara, dead! Then comes a straight-up Brad-Pitt-in-Seven move with the final deadhead. Daryl grabs Carol and tells her “Just look at me” as we see Alpha’s masterstroke — putting her daughter’s boyfriend’s moaning face on a stick. In the aftermath, Sid has a serious case of survivor’s remorse and Zeke’s Faire will be forever remembered for all the wrong reasons. The King and Queen have lost their son. Alden is single and the survivors have suffered a 50 percent decrease in semi-licensed physicians. Hilltop has lost its third leader, counting Maggie but not counting the worthless Gregory. (Could Daryl be the next in line? They’re running out of c-suite material, fast.) And if an attack on one community is an attack on all, how do they respond to a slaughter like this? Can’t go back to movie night when your friends and loved ones were beheaded by your neighbors. The tale comes full circle as Daryl — looking very dad-like — brings Lydia to the memorial site, where Hilde’s “H” necklace takes on a new meaning beside Henry’s stake. Not sure how the season finale will top this episode, but now there’s no doubt that the peace that followed the Savior War is over. Let the Whisperers War begin. Get the latest recap straight to your inbox.